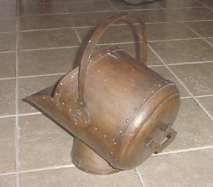 A few years ago I received an interesting phone call from a young man who heard that I was looking for Harry Dixon copperwork. He was the ex-husband of Harry Dixon's grand-daughter. He told me that his ex-wife's family has a whole house full of Harry Dixon copperwork and he asked me, "Do people really want that stuff?" He then had his ex-father-in-law, Robert Cooper, call me. Robert Cooper is married to Donna Cooper, Harry Dixon's daughter. I told Robert that I was researching Bay Area coppersmiths for a book that I was writing. He invited me over to their house here in the Bay Area. When I went over to visit for the first time, I was amazed at all the wonderfully hand-hammered copper items that they had.... the lamps, bowls, vases, tea kettles, coal buckets, boxes, and of course, the shop sign! When I looked at a few of the pieces that they had, I noticed that they were all signed in block letters "Harry L Dixon". 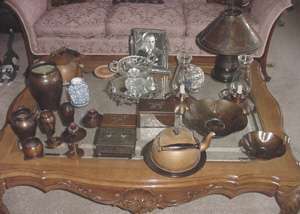 I then asked Donna Dixon Cooper, "How come some of your father's copperwork is signed Harry L Dixon? What does the 'L' stand for?" Donna said that her father's middle name was "Lester". "Lester?" I said, "I thought that Harry Dixon's middle name was St. John?" "Heaven's no" She said, "We're Presbyterian!" I thought that was strange. I told her that I had met her mother, Florence, back in 1989 at the San Francisco Dirk van Erp musuem show at the Fort Mason Center. Donna said, "No, my mother's name was Sally, not Florence." This was weird. Then, I asked about her uncle, Maynard Dixon, did they have any of his paintings? "No." She said, "I don't have any uncles!" "Well, when did your father, Harry Dixon, die?" "1977" She said. "I thought he passed away in 1967?" Well at this point I was dumb-founded and confused. Then, it finally dawned on me, "What if there were two coppersmiths named Harry Dixon?" My hunch was correct. Harry L Dixon was born June 30th, 1901 in Fall City, Nebraska. He grew up in Stockton, CA and graduated from Stockton High School in 1920. His only formal training in copperwork seems to be in his manual arts and industrial arts classes at Stockton High School. He seems to have continued his training with correspondence courses through Meyers Booth College in Chicago in the early 1920s while still living in Stockton. He moved to San Francisco about 1924 and got a job working for General Motors as a "Finance Note Man" according to census data and old phone directories. With the onset of the Depression in the early 1930s, he lost his job with General Motors. About 1932 he seems to have really taken up copperwork. Luckily, he photographed many of the pieces that the family kept. Most of these old photographs are dated 1932 or 1933. Many of the pieces in the photographs are still owned by the family today. 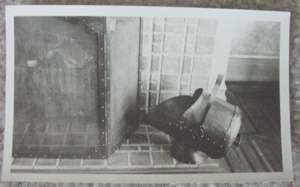 Unfortunately, the firescreen in the old family picture was broken and thrown away many years ago. Apparently, Harry L Dixon loved to work with his hands and make things. He was slow and methodical. 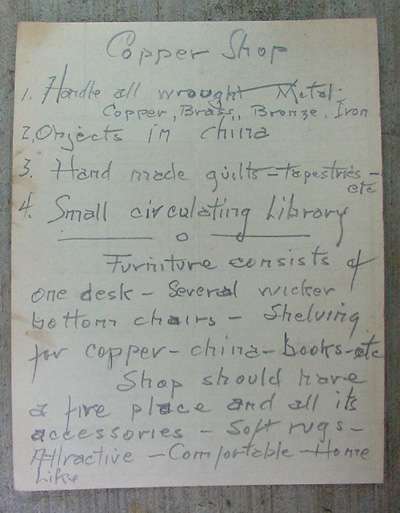 In his family files, I found a note, detailing his dream........ to have his own Copper Shop. He had just been working out of his garage. He wanted to have a shop, where people could come over and visit. He never opened his copper shop. Instead, he continued to work out of his garage on Lombard Street in San Francisco until 1934, when the family moved to Hayward. He did not seem to have the personality of someone who could have run his own business. He was much more adept at making beautifully, hand-crafted works of art, one-by-one. He kept a scrapbook of other people's copperwork. Anything that he liked from a magazine or newspaper, he would cut it out. Then he would make it himself. Notice the Japanese bowls that he copied. 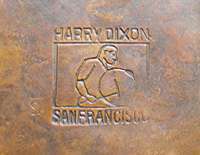 Although I could find no direct evidence of any relationship between Harry L Dixon and any of the other great Bay Area coppersmiths, it seems only logical that Harry L Dixon would have been familiar with the work of Dirk van Erp and even the other Harry Dixon. 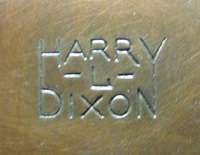 Harry L Dixon probably put the "L" in his signature stamp to differentiate himself from Harry St John Dixon. Harry L Dixon loved to experiment. I found a copy of the brocure for the patina formulas that he must have used from Gerstendorfer Bros, New York. 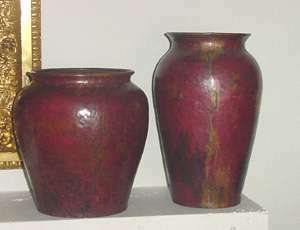 The brochure is full of rich colors that can be obtained on copper. 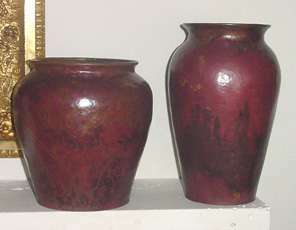 Look at these great red vases. Notice that the one on the left is a little bit "warty". Harry L Dixon must have seen some of Dirk van Erp's "warty" vases. 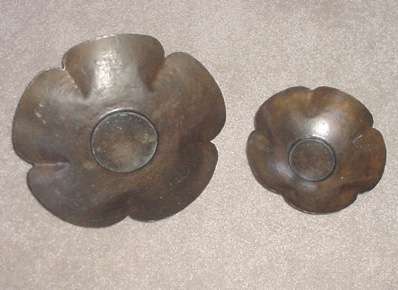 Harry L Dixon also made hammered copper and mica lamps, as well as other unconventional lamps. 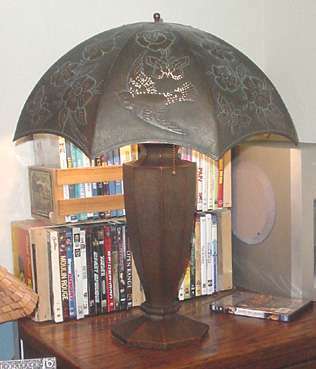 This copper and mica lamp has six seperate mica panels and is set on a Chinese wooden base. It is signed on the inside of the shade. It appears to have originally been made for an oil or kerosene lamp. Harry later convered to an eletrical lamp to be more practical. The eight-sided lamp on the right is quite unusual. 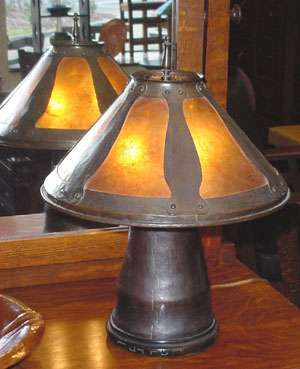 The base is reminiscent of Stickley Brothers or Limberts copper lamps.The detail of the pierced shade is extraordinary. Both lamps came from the family collection. Harry L Dixon's scrapbook is full of his original drawings or pieces that he made. Many of these drawing have the client's name, address, and the price charged. His drawings are dated between 1932 and 1939, with most of them dated 1933 and 1934 when he was still in San Francisco. His last drawing is a rendering for a mailbox that he made for his neighbors in Hayward, Helen and Olga Jacobsen. 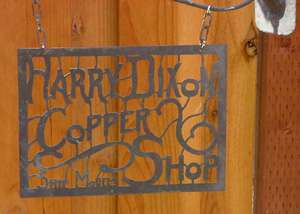 Besides copperwork, Harry L Dixon had a fascination with model ships, thus the reference on his shop sign. After his move to Hayward in 1934, his interest moved from copperwork to miniature train. Not model trains mind you, but the children-sized miniature trains that you see at Disneyland and other places. In fact, in the 1960s, Harry L Dixon met Walt Disney, and they became good friends. They must have shared a fascination with these miniature trains. Harry L Dixon's family still have two of Harry's miniature steam engines that Harry built from scratch. Ironically, his family prices these trains far more than any of his earlier copperwork. 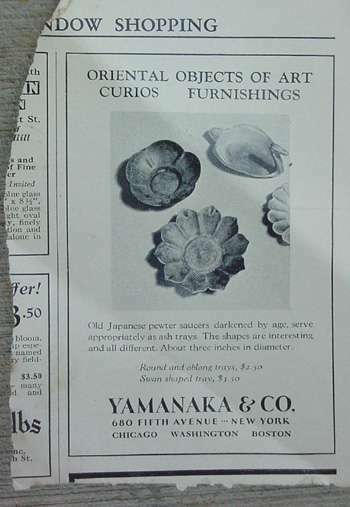 Dirk van Erp & His Influence Throughout the Bay"
We are always actively looking to purchase Stickley, Roycroft, Limbert, Dirk van Erp, Harry Dixon and other high quality Arts & Crafts pieces.